Guddl Globe String Lights with 27 Clear G40 Bulbs, Connectable Outdoor /Indoor Lights for Wedding Christmas Camping RV Garden Patio Gazebo Porch Pergola Bistro Backyard Balcony Deck, 25ft Black Wire. Install strands first with bulbs removed at the desired location then put bulbs onto sockets to avoid damaging. These 5-watt, 120-volt bulbs with candelabra base will shine for 3,000 hours and have Nickel-coated bases to prevent corrosion. Candelabra base (C7/E12) 2-1/4" tall and 1" wide. BROKEN BULBS?. 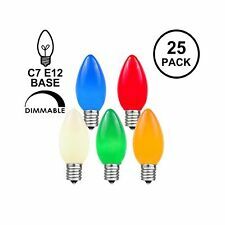 Each C7 bulb is 5 watts and 120V which gives just the right amount of light when lighting your house roof line for Christmas, your Christmas Tree, or a party string light for your restaurant or patio. These 5-watt, 120-volt bulbs with candelabra base will shine for 3,000 hours and have Nickel-coated bases to prevent corrosion. Candelabra base (C7/E12) 2-1/4" tall and 1" wide. BROKEN BULBS?.